When playing a sport it is our intrinsic competitive nature to use everything one can to gain an advantage. 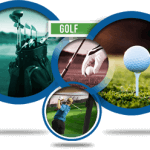 In respects to golf, players augment their abilities by using state-of-the-art technology in drivers, golf balls, apparel, and swing simulators. 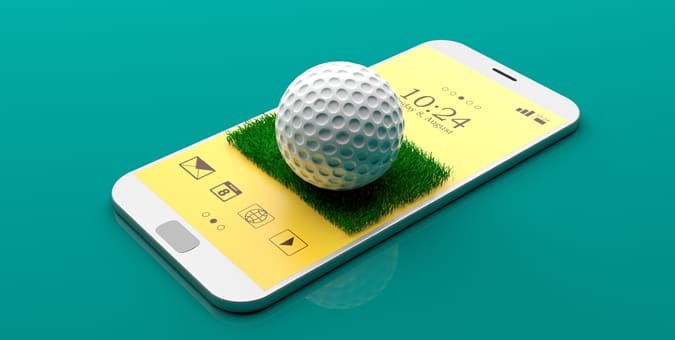 Additionally, golfers can now utilize another helpful technology that is emerging called augmented reality (AR) applications. AR apps blend the lines of real world views and Computer-Generated Imagery (CGI). The fundamental idea is superimposing computer generated graphics over the environment as we see it by using the camera function on mobile phones and tablets. Mobile devices use an actual picture generated by the camera and overlay essential graphical information to compliment the image in real-time, hence, augmented reality. It is improving how we, as humans, can see and interact with our external environment. There are many benefits that an augmented reality application can give golfers. The application helps the player to view the golf course from multiple vantages. They will be able to easily identify the green, bunkers, water features, trees, and the rough that the golfer would not normally perceive otherwise. The app can give specific distances to each feature while simultaneously giving golfers placement strategies to reach the green or provide safe lay-up options. Additionally, it can recommend what club is best for a particular shot. When developing an application that is targeted towards golfers it is advised to include the tools that all golfers need to improve their game. They need the best caddy in the world conveniently available via a mobile device application. This includes features that record the score and calculate handicaps, give player and golf club statistics, recommend clubs and give average distances hit with any particular club, give historical data and statistics about each hole in any particular golf course, way-finding, and putting help. To program an application that enhances what a user can see, the application must make use of the Global Positioning System (GPS) and compass hardware inherent in smart mobile devices. The geo-location hardware is going to be what the application relies on to accurately generate computer graphic overlays. Integrating with a mapping API will further the scope of your application by offering birds eye views and other vantage points. Google Maps is usually the preferred API but there are multiple proprietary and open source options available including the Microsoft Bing, MapQuest, Leaflet, Modest Maps, and Open Layers. The inclusion of a robust data aggregation tool will help take information and produce summarized statistical analyses that the application can rely on to give accurate and suggested feedback. Currently, there are only a few applications that use augmented reality to assist golfers in the endless quest for a lowered score. With this lack of competition it is a viable option for an application entrepreneur to capitalize on the growing augmented reality market. A forecast report by Research and Markets called Global Augmented Reality Market 2014-2018 and summarized by Business Wire speculates that the global market for augmented reality applications will increase at a compound annual growth rate of 132 percent. This is due to the stabilized mobile infrastructure around the world and the increase of augmented reality applications being engineered. Augmented reality is still in its infancy but the practical uses are limitless. The advantages gained by using an augmented reality application are analogous through multiple industries including gaming, travel, hospitality, F&B, transportation, healthcare, and e-learning. Augmented reality is still nascent, thus, big players have not had the chance to develop and mainstream any specific application that dominates the market in any industry. This reduces some of the entry barriers that application providers would need to overcome. Chetu, Inc. does not affect the opinion of this article. Any mention of specific names for software, companies or individuals does not constitute an endorsement from either party unless otherwise specified. All case studies were written with the full cooperation, knowledge and participation of the individuals mentioned. Chetu was incorporated in 2000 and is headquartered in Florida. We deliver World-Class Software Development Solutions serving entrepreneurs to Fortune 500 clients. Our services include process and systems design, package implementation, custom development, business intelligence and reporting, systems integration, as well as testing, maintenance and support.Chetu's expertise spans across the entire IT spectrum.